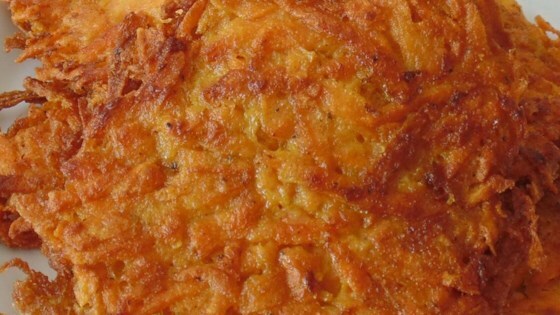 "A spicy sweet potato version of a traditional Jewish favorite." Combine flour, curry powder, white sugar, brown sugar, baking powder, cumin, salt, cayenne pepper, and black pepper in a bowl. Whisk together eggs and milk in a separate bowl. Pour into flour mixture and stir until well blended and batter has no lumps. Stir in sweet potatoes until fully combined. Heat enough oil to cover the bottom of a heavy skillet over medium heat. Drop batter by tablespoonfuls into hot oil, using spatula to flatten. Fry until well browned, about 3 to 5 minutes per side. Keep these latkes small. They don't get quite done if they're too thick. Sounded so good, but not to my liking. I only used 1/2 the white sugar, but it was still too sweet for me. Wasn't excited about the other flavor combinations either. Won't make again. Easy peasy and delicious , sweet potato could have done with a little more cooking. Great comfort food for a cold winters day! Awesome! Wouldn't change a thing. Spicy, sweet, and crispy! 6 stars! Highly recommended! Made exactly as written. Delicious. loved it! followed the recipe. was looking for variety from the usual sweet potato latkes. loved the curry!